Freelancing is becoming more and more popular and it's important to know which websites are actually worth investing time in as many of those websites fail to protect the seller and often results in work being unpaid. This is only one side of the coin though, as other websites cannot also protect the buyers with the latter paying for work that does not correspond to their initial requirements. As such, when stepping into the freelance market, it is important to identify which websites provide all those safety aspects for both sellers and buyers while having a big enough userbase with a variety of projects since it would serve little purpose to join a website where only a handful of projects are posted each week, and none of those are in your field of expertise. As such, this posts focuses exclusively on those websites that are secure while providing enough projects. With Rent A Coder being one of the first freelance sites around and essentially starting and defining the market, this is without doubt the place where you should start. In addition to having an enormous database of both buyers and sellers, Rent A Coder boasts a multitude of features that make this freelance website one of the best places to sign up. Its escrow system protects both the buyers' and sellers' interests, and its internal communication features, which include weekly reports for projects exceeding a certain bid amount, and feedback system guarantee projects run smoothly. 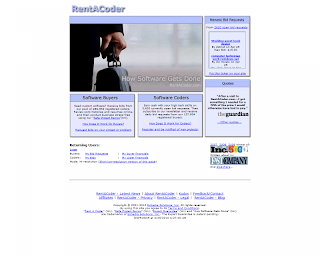 Rent A Coder is definitely the best freelance website, and numerous projects get posted on a daily basis, ranging from beginner projects with bids averaging $10-$100 to more complex projects requiring bids around $5,000. Due to the high number of users on Rent A Coder, newcomers may have to place extremely low bids to win projects and first build a reputation, but once you've made a name of yourself, Rent A Coder is the place to be. 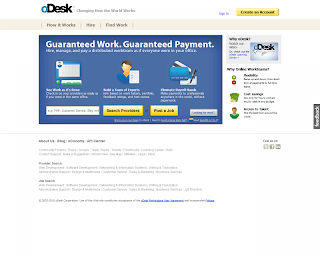 oDesk is another famous freelance marketing website and was founded in 2004. Since then, it has been acclaimed for providing a formidable place where buyers and sellers can quickly get projects started. oDesk however essentially caters for more complex projects, with bids averaging $3,000 to $5,000, so it may not be the place to start for a newcomer. It is nevertheless a great place to sign up for small businesses. oDesk has however received some criticism for its intrusive system. Freelancer.com, formerly known as GetAFreelancer, is another website that has been around quite some time, but it initially failed to be successful due to a low userbase and its inability to protect sellers against fraudsters and the high number of cancelled projects. However, with the boom triggered in the freelance marketing, it has grown in recent year and Freelancer.com now definitely ranks among the best freelance websites. 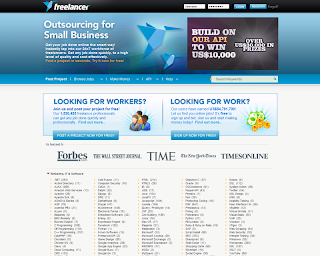 Although inferior in size and reputation to Rent A Coder and oDesk, it is easier to get started on Freelancer.com. The site however has a higher ratio of scammers, so it is essential that you pay close attention to their feedback and history before embarking on a project. As mentioned earlier, these are just the best three websites. There are several other great freelance websites such as Elance, Guru, and Scriptlance, which are also worth checking out if you are not satisfied with the three mentioned above.